➤ Upon arrival, you will be welcomed by our representatives at the arrival hall and then proceed to the Krabi City Tour and visit Wat Thum Sir 'Tiger Cave Temple' and Marine Fish Farm where you get to see the collection of all kinds of fishes from the Andaman Sea. ➤ You will then be transferred to hotel for check in. Free at own leisure. ➤ NOTE : Krabi City Tour can only be arranged on arrival day (flight before 1.30pm). Non refundable if later flight arrival. ➤ After breakfast, whole day free at leisure. Overnight stay at the hotel. ➤ After breakfast, leave to Phi Phi Island by High Speed Boat and visiting Maya Bay, Pilay Bay, Bird Nest Cave, Monkey Beach, Loh Samay Bay, Phi Phi Lay Island and finally Phi Phi Don Island for snorkeling , swimming or relaxing. 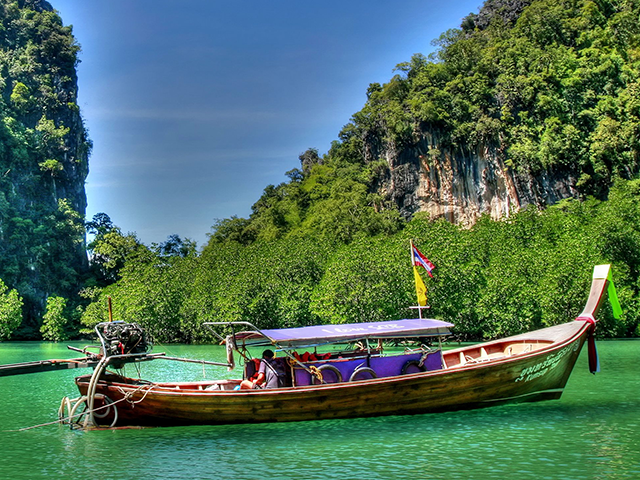 ➤ After lunch at Phi Phi Don Island, transfer to Phuket by Cruise. ➤ Upon arrival at Phuket, transfer to hotel for check in (around 5.00pm). ➤ After breakfast, check out and proceed for Phuket City Tour visiting Wat Chalong Temple, Rawai Beach view the Sea Gypsy village, local products, Cashew Nut Factory, Phuket Town, view the Sino-Portuguese Building. ➤ Thereafter, you will then be transferred to the airport for your onward flight. ➤ NOTE : Phuket City Tour can only be arranged on departure day (flight after 2pm). Non refundable if earlier flight departure.